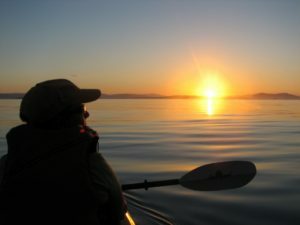 Kayaking around San Juan Island. Last summer, I wrote on the blog a strategy to end emotional eating by having a Summer Bucket List. It was an opportunity for me to declare what I wanted to accomplish over the summer so I could then know I “got something done.” I put many items on my list and many were accomplished like: read 3 fun books, try Stand Up Paddle Board and go camping. I felt successful and really saw how I could accomplish a goal. Having the goal written down increased my ability to plan it into my schedule and then get it done. I spent some time this last weekend contemplating what I wanted to do this summer and I got excited about the possibilities. Buy and use a Boogie Board. Read 3 fun novels (guess there is a theme to this one). Make a stepping stone for the garden. Take care of my health (I have been feeling sluggy lately). I noticed these are qualities I want to increase for myself. So I can now ask myself, Is what I am about to do going to increase my health? Will it bring in playfulness? Will I be practicing more creativity? I found myself excited by the opportunity to not just end the summer with projects completed, but a better sense of myself. Want to create your own bucket list? Here is the link to a quick download of my Summer Bucket List. Consider adding more to the list, which can include qualities you want to increase in your life this summer like: peacefulness, joy, happiness. Join me in seeing what a difference we can make this summer in our lives overall. What is on your bucket list this summer? Give me/us some more ideas in the comments below.